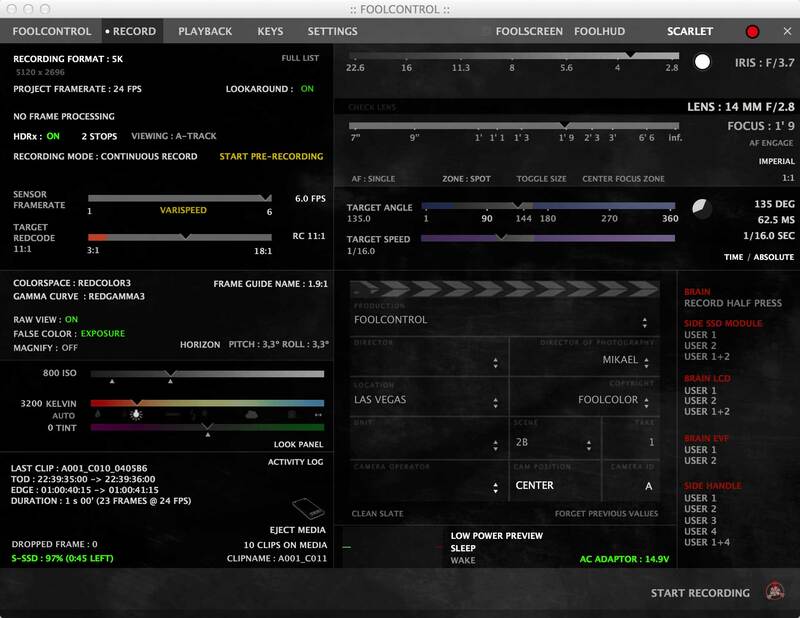 NAB is over, so as promised, foolcontrol pre-release try out version is available for download. It works with GIG-E cable or REDLINK bridge connection. Feedback, bug report or feature request can either be sent to this thread or directly by email. Have fun playing with it and thanks for those who already purchased a license during NAB. You will need to set up the connection on camera and computer so they are on the same network before you can connect (Ad-Hoc or infrastructure for wifi. DHCP or manually + enabling External Control for gig-e). This pre-release version lacks a few features that I will be quickly adding in the coming weeks. If your computer is connected to the internet while launching the app (and not always directly to the REDlink ad-hoc network) check in the lower right if a new version is available for download. You will need a BlackMagic DeckLink or UltraStudio (like the TB mini recorder) to use the foolscreen features (video preview, snapshots, still image overlay). May add AJA support later. Check the '?' at top right of main window for keyboard shortcuts. The app hasn't been tested on too many OS X configurations so please contact me if you run into an issue with it or have any question. This was really a treat to see in person Mikael. I think everybody was really impressed by the features. That little USB focus knob you had setup was pretty cool too. I can see a lot of applications for something like this. I'm also seeing a lot of potential to where this and REDLINK can come in real handy for MOCO shoots. Hey Mikael, it looks great. You mentioned "...- whatever else you may suggest": For iPad or Mac -- Is there an option to have parameters animated. Such as focus (e.g., EF lenses). I imagine it in the following way, one presses the record button and the parameters start to change (linear or ease/ease). If there is an option to sync that to the actual frames, is there an option to write out a little list (001,parameter1; 002, parameter2; etc)? Or just a record of the change while sliding the finger over the iPad. The list can be read into, e.g., Cinema 4D, and from there any animation could be in sync with the compositing later on. A rack focus is not simple to match manually (eyeballing), especially not while under a deadline, this would help a lot. Last edited by Dr. Sassi; 04-11-2014 at 08:14 PM. iOS seems a better fit, especially for the AC's. Many folk (myself included) find the Redmote totally worthless. Giving the AC's the control the Redmote promised but on their iOS or Android would be a huge help. Mikael - I am downloading the trial version to check it out. I have ordered the RED Bridge and am excited about the potential. Small question - if we start with the Scarlet version, is there an upgrade path when we move to Epic or Dragon? Of course, just contact me by email. If your camera gets upgraded from SCARLET to EPIC = pay the difference and get a locked license for your new camera. If your camera gets repaired or if your EPIC gets DRAGONized and the PIN number changed = free new license regenerated. If you started with a cam locked license and wish to move to the unlimited one = we will also find a way to upgrade your license.